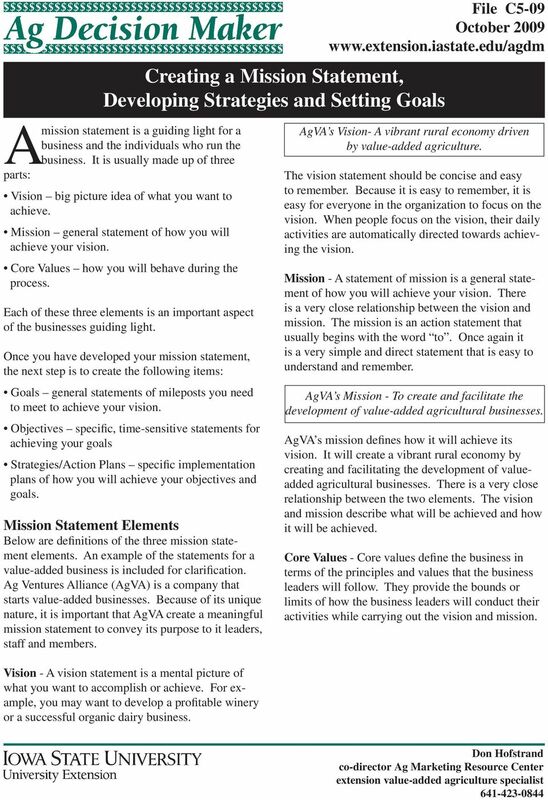 Download "Creating a Mission Statement, Developing Strategies and Setting Goals A"
2 Page 2 File C5-09 AgVA s Core Values: Provide economically sound business opportunities for our members. Practice high ethical business standards. Respect and protect the environment. Produce high quality products that are safe for consumers. Meet the changing needs and desires of consumers. The core values tell a lot about the the leaders of AgVA and how they will conduct their business activities and relationships. Characteristics of Good Mission Statements To create a successful mission statement, you should keep the following concepts in mind. Simple - Your mission statement should be simple. However, creating the statement is usually not easy. It may require several drafts. The statement needs to capture the very essence of what your business or organization will achieve and how you will achieve it. The statement should be short and concise. The fewer words the better. Use just enough words to capture the essence. Most mission statements are too long. People tend to want to add additional information and qualifications to the statement. Usually these statements just confuse the reader and cloud the real meaning of your statement. Each successive draft of your statements should be to simplify and clarify by using as few words as possible. Your statements of vision and mission should be a single thought that can easily be carried in the mind. To test the effectiveness of a mission statement in a business, ask its leaders, managers and employees to tell you the vision and mission of their business. If they cannot instantaneously tell you both, their mission statement is of little use. The vision and mission guide the everyday activities of every person involved in the business. To be effective, your statements need to short and simple, capturing the essence of what you want to accomplish. Fluid Process - People agonize over writing mission statements. Granted, it is usually not a simple or easy process. However, the statements are not cast in stone. They can be updated and modified later. It is often best to do the best job of writing it as you can, use the statement for a period of time, and then revisit it a few months or a year later. It is often easy to sharpen the statement at that time. Remember, the reason you are writing the statement is to clarify what you are doing. Unique Businesses - It is usually more important to write mission statements for unique or non-traditional businesses where the purpose of the business is not generally known. Mission statements are important for these businesses so that everyone involved in the business understands what the business will accomplish and how it will be accomplished. In essence this means keeping everyone on the same page so they are all pulling in the same direction. The Role of Goals and Objectives Once you have developed your vision, mission and core values, you can then develop the goals and objectives needed to achieve your vision. Goals - Goals are general statements of what you want to achieve. So they need to be integrated with your vision. They also need to be integrated with your mission of how you are going to achieve your vision. Examples of company goals are: To improve profitability To increase efficiency To capture a bigger market share To provide better customer service To improve employee training To reduce carbon emissions A goal should meet the following criteria: Suitable: Does it fit with the vision and mission? Acceptable: Does it fit with the values of the company and the employees? 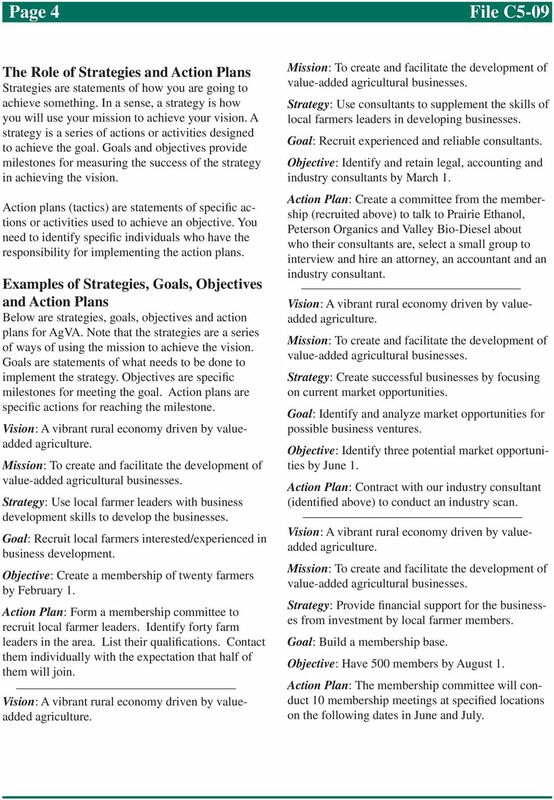 4 Page 4 File C5-09 The Role of Strategies and Action Plans Strategies are statements of how you are going to achieve something. In a sense, a strategy is how you will use your mission to achieve your vision. A strategy is a series of actions or activities designed to achieve the goal. 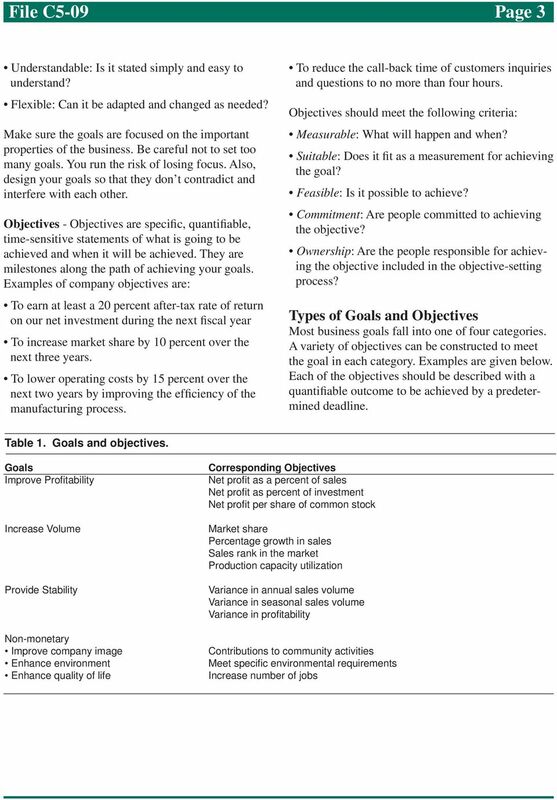 Goals and objectives provide milestones for measuring the success of the strategy in achieving the vision. Action plans (tactics) are statements of specific actions or activities used to achieve an objective. You need to identify specific individuals who have the responsibility for implementing the action plans. Examples of Strategies, Goals, Objectives and Action Plans Below are strategies, goals, objectives and action plans for AgVA. 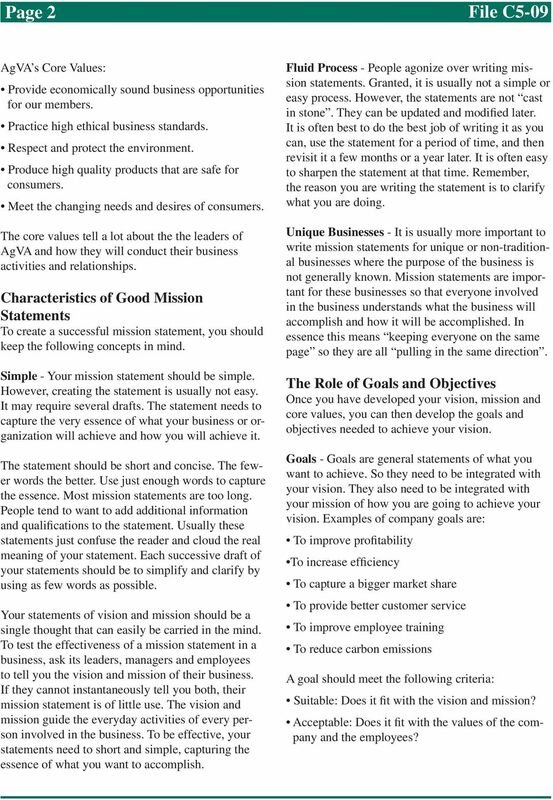 Note that the strategies are a series of ways of using the mission to achieve the vision. Goals are statements of what needs to be done to implement the strategy. Objectives are specific milestones for meeting the goal. Action plans are specific actions for reaching the milestone. Strategy: Use local farmer leaders with business development skills to develop the businesses. Goal: Recruit local farmers interested/experienced in business development. Objective: Create a membership of twenty farmers by February 1. Action Plan: Form a membership committee to recruit local farmer leaders. Identify forty farm leaders in the area. List their qualifications. Contact them individually with the expectation that half of them will join. Strategy: Use consultants to supplement the skills of local farmers leaders in developing businesses. Goal: Recruit experienced and reliable consultants. Objective: Identify and retain legal, accounting and industry consultants by March 1. Action Plan: Create a committee from the membership (recruited above) to talk to Prairie Ethanol, Peterson Organics and Valley Bio-Diesel about who their consultants are, select a small group to interview and hire an attorney, an accountant and an industry consultant. Strategy: Create successful businesses by focusing on current market opportunities. Goal: Identify and analyze market opportunities for possible business ventures. Objective: Identify three potential market opportunities by June 1. Action Plan: Contract with our industry consultant (identified above) to conduct an industry scan. Strategy: Provide financial support for the businesses from investment by local farmer members. Goal: Build a membership base. Objective: Have 500 members by August 1. Action Plan: The membership committee will conduct 10 membership meetings at specified locations on the following dates in June and July. 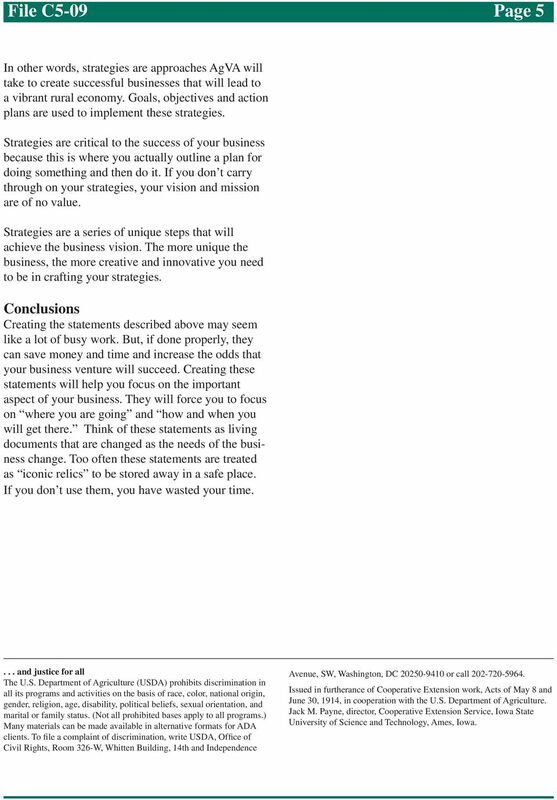 5 File C5-09 Page 5 In other words, strategies are approaches AgVA will take to create successful businesses that will lead to a vibrant rural economy. Goals, objectives and action plans are used to implement these strategies. Strategies are critical to the success of your business because this is where you actually outline a plan for doing something and then do it. If you don t carry through on your strategies, your vision and mission are of no value. Strategies are a series of unique steps that will achieve the business vision. The more unique the business, the more creative and innovative you need to be in crafting your strategies. Conclusions Creating the statements described above may seem like a lot of busy work. But, if done properly, they can save money and time and increase the odds that your business venture will succeed. Creating these statements will help you focus on the important aspect of your business. They will force you to focus on where you are going and how and when you will get there. Think of these statements as living documents that are changed as the needs of the business change. Too often these statements are treated as iconic relics to be stored away in a safe place. If you don t use them, you have wasted your time.... and justice for all The U.S. Department of Agriculture (USDA) prohibits discrimination in all its programs and activities on the basis of race, color, national origin, gender, religion, age, disability, political beliefs, sexual orientation, and marital or family status. (Not all prohibited bases apply to all programs.) Many materials can be made available in alternative formats for ADA clients. To file a complaint of discrimination, write USDA, Office of Civil Rights, Room 326-W, Whitten Building, 14th and Independence Avenue, SW, Washington, DC or call Issued in furtherance of Cooperative Extension work, Acts of May 8 and June 30, 1914, in cooperation with the U.S. Department of Agriculture. Jack M. Payne, director, Cooperative Extension Service, Iowa State University of Science and Technology, Ames, Iowa. CORN IS GROWN ON MORE ACRES OF IOWA LAND THAN ANY OTHER CROP. Member programs and services La Plata Electric Association provides its members safe, reliable electricity at the lowest reasonable cost while being environmentally responsible. Save this for reference. A GUIDE TO NONPROFIT BOARD SERVICE IN OREGON Office of the Attorney General Dear Board Member: A GUIDE TO NONPROFIT BOARD SERVICE Thank you for serving as a director of a nonprofit charitable corporation.